High-Altitude –Low Opening: a parachuting technique commonly referred to as a HALO jump. The technique is used by military special operation forces across the globe to prevent detection, and the dangers associated with it. Most HALO jumps involve jumping out at an altitude of 25,000 feet and freefalling down to 3,500 feet before opening the chute. Plummeting at 126 mph, only to be snapped back instantly and painfully, can be daunting. However, one must also contend with the hazardous physical effects of high altitude. 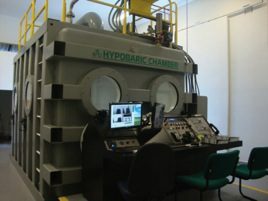 Since everybody is affected uniquely, each must go through periodic tests using a hypobaric chamber, specifically one complying with highly specialized ASME code. Complex. Performance. One describes the process. The other is all about successfully performing the task-at-hand. 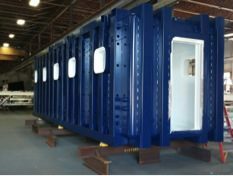 When an Original Equipment Manufacturer (OEM) seeks a fabrication company to manufacture one of their hypobaric chambers, the available options are limited. 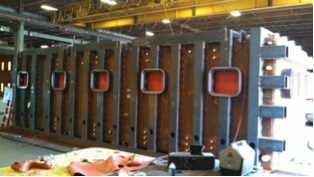 This project profile summarizes how GSM Industrial was able to successfully perform one of these complex chamber projects. Specifically it focuses on our capabilities to manufacture the chamber to ASME section 8, division 1 standards. After detailing the engineered drawings, provided by our customer, we procured all material for the chambers with the exception of the window and door frames. 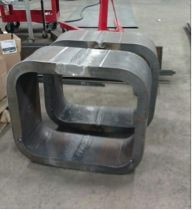 These items, as well as the machining required for the window frames, were provided by our customer and delivered to GSM Industrial to assemble. 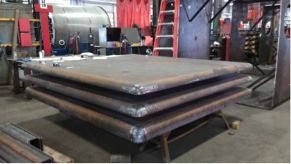 Fabrication, machining, welding & assembly of all items within our scope of work were done at our 110,000 square foot facility, located in Lancaster, PA. Material thickness ranged from 1/4’’ to 3’’ and involved both carbon and stainless steel components, as part of the ASME pressure vessel. Two noteworthy components in our scope included fabrication of the dished head assemblies and welding the window frames. The dished heads were flawlessly executed and spotlight GSMs fabrication capabilities. The window frames, however, showcased how GSM, with over 30 years of experience, can still learn valuable lessons. The window frames required a successful Charpy Impact Test. This standardized test, once used to understand material fracture problems with WWII ships, determines the amount of energy absorbed by material during fracture thus determining notch toughness. To perform this test, a weighted pendulum is set to a designated height before being released. The controlled weight and height used for this test varies. After failing the three previous attempts, we passed the fourth. Challenge met. Valuable lessons learned. In addition to the Charpy Impact Test, over $30,000 worth of other testing was necessary to obtain the ASME certification. These included some form of testing or redundant testing on all weld seams. The following tests to meet ASME code included: Penetration Testing; Ultrasonic Testing; Magnetic Particle Testing; and Radiographic testing. The Radiographic testing, in particular, included over 300 film shots. Another required test for the chamber included a Hydrostatic test. For this, the chamber was filled with 18,000 gallons of water. Some of these tests were performed by GSM; others by third party inspectors. All were conducted within our shop. After successfully completing all tests, GSM Industrial then blasted and painted the chamber. Finally we stamped the chamber, showing it was designed, fabricated, inspected, tested, marked, and stamped in adherence to ASME section 8, division 1 standards. Our customer subsequently performed all additional procedures and tests for the chamber to be certified for human occupancy. With the successful completion of the hypobaric chamber requiring ASME standards, GSM Industrial was recently awarded, by this same customer, a second opportunity to manufacture one of their hyperbaric chambers. This chamber is a decompression tank used for other applications, such as the treatment of decompression sickness, a hazard commonly attributed to scuba diving. Learning from our first project, GSM Industrial looks forward to the challenge to deliver this current project and exceed even more of the customer expectations. We would like to thank our customer for the opportunity to work with them on these projects. We look forward to a long and successful business relationship.